The construction of this baroque church started in the ‘600’s for will of the nuns as an addition to the adjacent convent of the Franciscan Clarist Congregation (le Monache Clarisse in Italian). 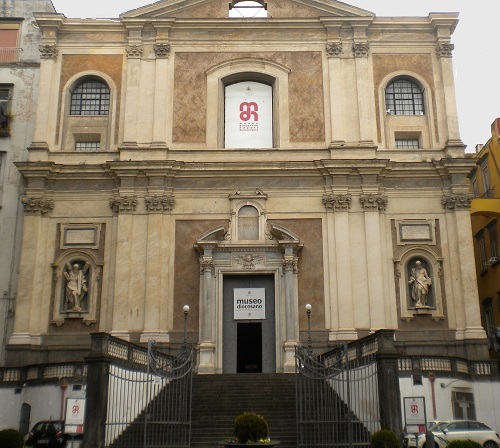 The convent, which already existed in the eighth century was already equipped with a church: the Santa Maria Donnaregina old, built in the fourteenth century. Originally the new church was directly accessible from the older one through the apse area. After the 1928-1934 restoration the two churches were separated and made independent. The Donnaregina nuova rises on top of a nice trachytic and marble stairway. 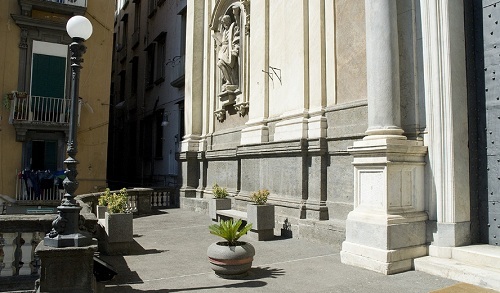 The Neoclassical façade characterized by two orders of pilasters with Corinthian capitals, has on the first level two niches, at the portal’s sides, with the statues of Santi Bartolomeo e Andrea and at the second level windows with marble frames. 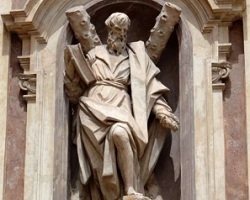 The church's name included Nuova (new) to distinguish it from the church of the same name, thereafter known as Vecchia (old). 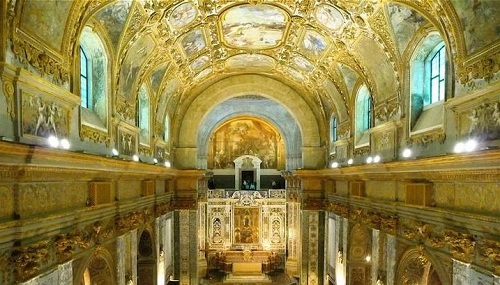 Designed by architect Giovanni Giacomo di Conforto and consecrated in 1669, this church is a prime example of the exuberant barocco napoletano architectural style. The building facade was already completed in 1626. The marble portal, the work of Bernardino Latin, was added in 1647, while the dome was built in 1654. 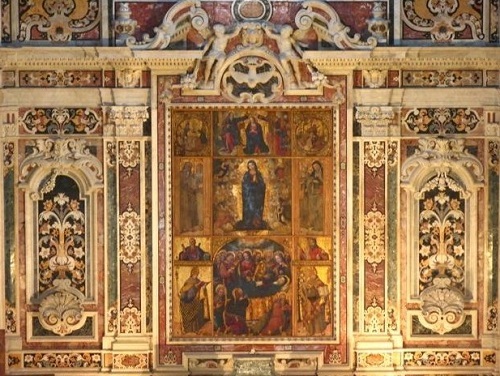 During the this time (from 1647 to 1654) the presbytery had a temporary cover decorated with a large 1626 painting by Aniello de Vico. This rather simple exterior hides an extravagantly decorated interior, which consists of a single nave, sheathed in polychrome marble and Neapolitan floral designs flanked by three chapels on each side. 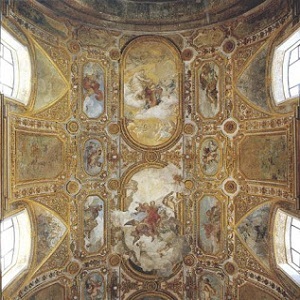 The side chapels are decorated with frescoes by Francesco Solimena, while another artist, Francesco di Benedictis, painted the ceiling frescoes and new dome was painted in 1655 by Agostino Beltrano. The ante-sacristy was decorated with stucco and frescoes by Santolo Cirillo. 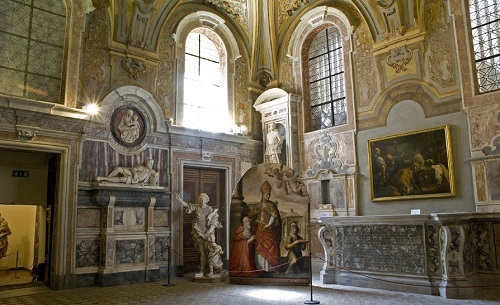 The sacristy has paintings by Massimo Stanzione and Charles Mellin, and two still lives from the 16th century. The construction of a new bell tower was started in 1681, but was abandoned after opposition from the nearby convent of the Sisters of St. Joseph of Ruffi.